Yesterday I shared our food preparation for our Teddy Bear Picnic. Today I'm going to share some of our activities. As the children arrived we gave them a teddy bear frame to color. I found this great picture at Twisty Noodle. 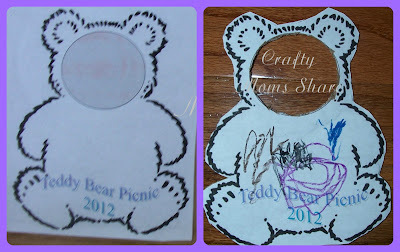 I resized it and put two on a page and then added Teddy Bear Picnic 2012 onto it. I Mod Podged it to cardboard and cut them out and cut out a circle for the face so we can add the kids' pictures. My plan was to Mod Podge over their coloring, but none of them really finished them. Then I planned to add a magnet to the back. We also had music playing. I burned a CD with any song I could find that mentioned teddy bear or just bear. Most of them came from Teddy Bear Tunes by Georgiana Stewart, and then we used some from The Wiggles (Let's Wiggle, Racing to the Rainbow, Pop Go The Wiggles, Go Bananas! and Hot Potatoes: The Best Of The Wiggles albums),The Countdown Kids; 150 Fun Songs For Kids (Disc 3), David Polansky's Animal Alphabet Songs, and VeggieTales' 25 Favorite Toddler Songs! We had these songs playing but we also used them for some games. 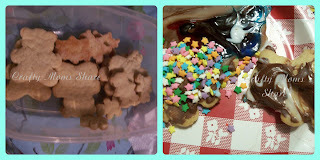 Another activity was to decorate teddy bear sugar cookies. The kids had a great time with this. I shared this yesterday as well. The decorated cookies above are Hazel's. We also dropped those capsules that melt into sponge animals into cups of hot water. Each one was a different teddy bear sponge. Each child got to do four. And we passed a teddy bear around. The person who won the game got to keep the teddy bear. I had bought it at Ocean State Job Lot for $3 or $4. Next we played Pin the Tail on the Teddy. I hand drew a teddy bear in a sideways position and penciled in his tail. We blindfolded the kids or had them close their eyes (the younger ones did not like being blindfolded) and spun them around and had them tape tails onto the poster. I had written their names on a tail. Hazel won this one! She already got her prize which was this purple teddy sippy cup. Then we played a game of Musical Teddy Bears. Everyone brought a teddy bear to the circle and placed them in the middle and then we removed one. I played music and had the kids walk around the blanket. When the music stopped they had to grab a bear (it did not have to be their own). If they did not get a bear, they were out. The person who won this one got the same sippy cup Hazel did. I found them at CVS Pharmacy. It worked out that each child won one game. I love when it works out that way. Then we gave each child felt pieces to put together a two-dimensional teddy. 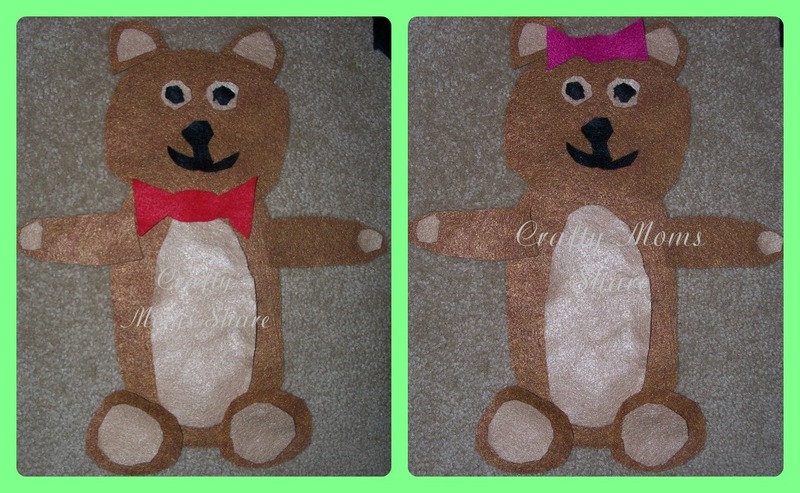 They each got two colors of bows and could make boy or girl teddy bears. 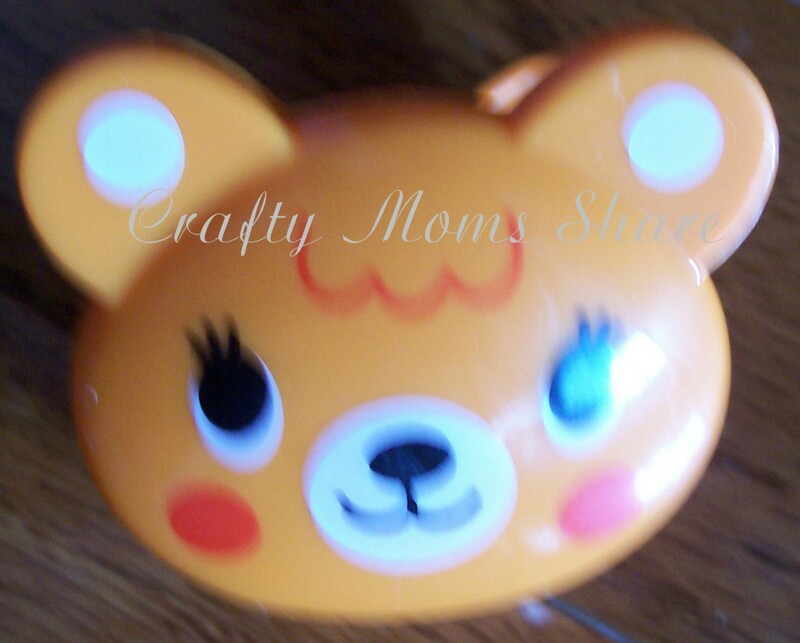 Each child also got two teddy clips. The kids of course also played tag and on the swings. They had a great time! We had a few more activities to do, but didn't get to them. One is the Teddy Bear, Teddy Bear Turn Around Dance. There are several different versions on-line. A couple can be found at Can Teach with some other teddy bear songs/poems. Songs for Teaching has Jack Hartmann's version. I also had a couple of books including Michael Hague's Illustrated The Teddy Bear Picnic by Jimmy Kennedy. There are so many great teddy bear books out there that there a lot from which to choose. So now I need to start planning our butterfly party. Stay tuned for what we do at that. A Teddy Bear picnic sounds so fun. I love the musical teddy bears game. 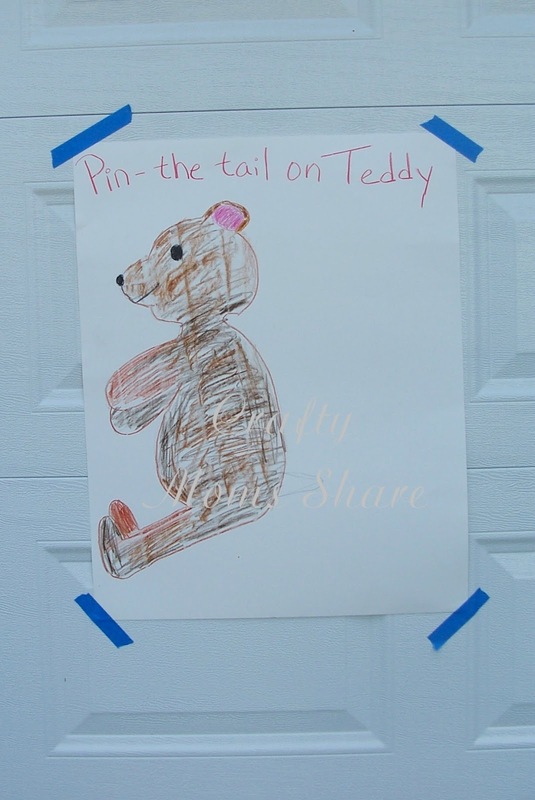 I love the creative activities for a teddy bear picnic. So sweet. I got it at CVS, but have seen them elsewhere. It was a few years ago now though.